You heard it here first – Sheikh Zayed’s Al Guezira Plaza will be the hottest spot in 2018. With the likes of Cairo Jazz Club 610, The Tap West and Andiamo set to open, some of the biggest names in the city will all be in one place. Places like Izakaya have already impressed and one of the newest venues comes in the form of La Taberna. As a venue, there’s a lot of beautifully elegant woodwork in the interior, which is complimented by the light navy and ruby red chairs and turquoise couches. The bar is right in the middle and surrounded by regular seating with chairs and fixed couches, as well as high tables. Granted, some of the chairs are quite small and the couches are much lower than the chairs, but it all makes for an eclectic set-up. While many bars’ and pub’s menus are limited, La Taberna offers a much fuller one, from which we opted for the Avocado Mango Salad (105LE) and Shrimps with Garlic Chilli (165LE) to start. 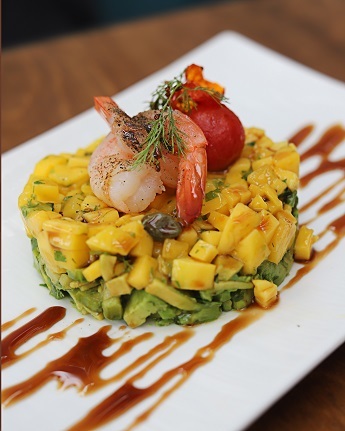 The salad came as a layer of diced avocado, topped with a layer of diced mangoes and two simply seasoned shrimp, all of which was surrounded by drizzles of a very tangy vinaigrette-like sauce. The flavours overall were very simple and delicate, but maybe a little too much – we expected something more, something bolder. Meanwhile, the shrimps with garlic chilli didn’t live up to its name. We were really expecting a strong spicy kick complimented with garlicky flavour, but the amount of lemon in the sauce overpowered everything to the point that we didn’t feel the presence of garlic chilli flavour at all. The shrimps, however, were well-cooked, and it was an enjoyable appetiser overall. When it came to the main dishes, the menu offers quite a few standard dishes – think burger, fillet mignon with mushroom sauce, roasted salmon, et al. But therer are also a few much more interesting items, of which chose the Paella (250LE) and Spanish Style Beef Skewers (160LE). 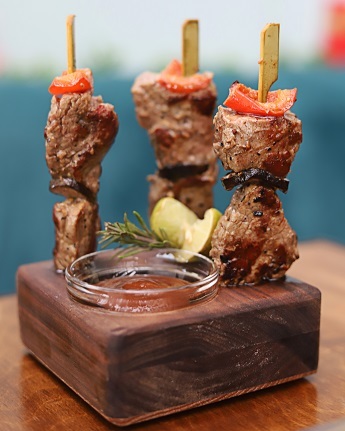 Although the beef skewers were slightly overcooked, the beef was still juicy and full of flavours which indicate that it was well-marinated. On the other hand, we felt that there was no need for the spicy bbq dip, since it was far too strong and overshadowed the beef flavour – but the presentation definitely caught our attention. 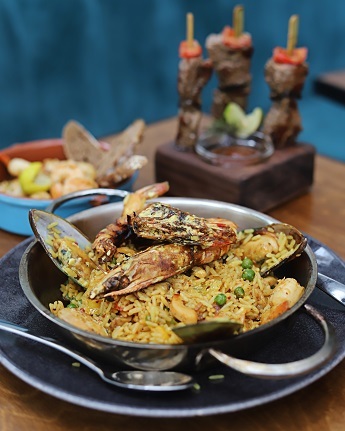 Moving to the paella, we absolutely loved how the saffron rice was moist, fluffy, full of spices and far from mushy. The variety of the seafood, which was perfectly cooked, was just impressive, and the portion was quite generous. Sadly, the grilled jumbo shrimps on top were overcooked to mushiness. Despite this, though, it didn’t take too much shine off of what could develop to be one of the best restaurant-bars in Cairo. 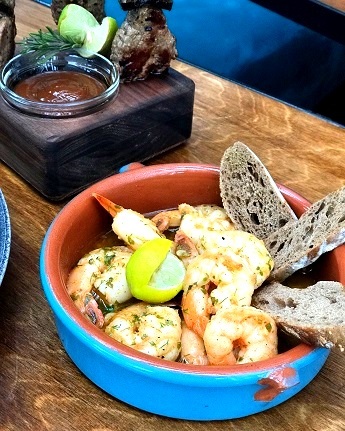 Despite the few flaws in the dishes, we still had a great time thanks to the cosy ambiance and the fantastic service – two things that could well make it a favourite in the area for a long time to come. Like all restaurant-pubs, La Taberna makes for a great lunch spot in the afternoon, an elegant dinner spot in the evening and a rowdy rumpus room at night. Good food, great service, comfy atmosphere. Small issues kept good dishes from being great ones.